The city center, called the Sydney Central Business District (CBD), is filled with things to do and see both at night and during the day. Take an evening harbour cruise from Circular Quay. Sample some great Asian food in Chinatown, visit attractions at Darling Harbour. Darling Harbour is only a short walk away with a Lightrail service to Sydney Exhibition Centre and the Sydney Convention Centre. Find Sydney Tourist Attractions by Name. 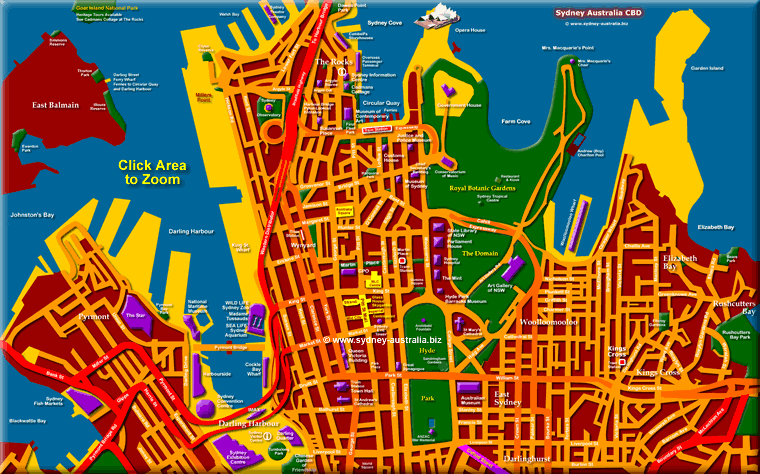 Showing location of Sydney shopping, museums, attractions and touristic places to see. Next Picture: NSW Maps - NSW Maps. Previous Picture: Australia Maps - Australia Maps. Where to go in Sydney: The most likely place to start exploring would be Circular Quay and The Rocks. Click on the Sydney Opera House to zoom. The Rocks Historical District, at the foot of the city by Circular Quay, has cobbled streets, museums, shops, art galleries and restored buildings from the early 19th century. The Sydney Harbour Bridge is a short walk away, with the Sydney Opera House located just on the other side of the Cove. Darling Harbour has lots to see and do for the whole family: The Powerhouse Museum, the Australian Maritime Museum, the Sydney Aquarium and the Wildlife Center are all within easy reach. To get there: Take the ferry from Circular Quay to Darling Harbour, or catch the Lightrail from the city main train station. It is also an easy walk from the city via the Pyrmont Bridge at the end of Market Street. Another way of getting there would be to catch a train or bus to Central Railway station, then take the light rail to Darling Harbour. See more about Darling Harbour Attractions, Restaurants and Shopping. And of course chances to go shopping. Darling Harbour, the Rocks and the City Center Pitt Street Mall have shopping arcades, department stores, brand name retailers, jewellery and accessory shops, and speciality stores. Nearby on the main streets you will find plenty of other opportunities. Shopping in Sydney. Find Sydney Tourist Attractions by Map Alphabetically. Find Alphabetically: location Find Sydney Tourist Attractions by Map Alphabetically.